Pendleton County was formed six years after the close of the Revolutionary War, in 1789. The county was formed out of land that had been conquered from the Cherokee Nation in 1776 but which had remained largely unsettled until 1783. 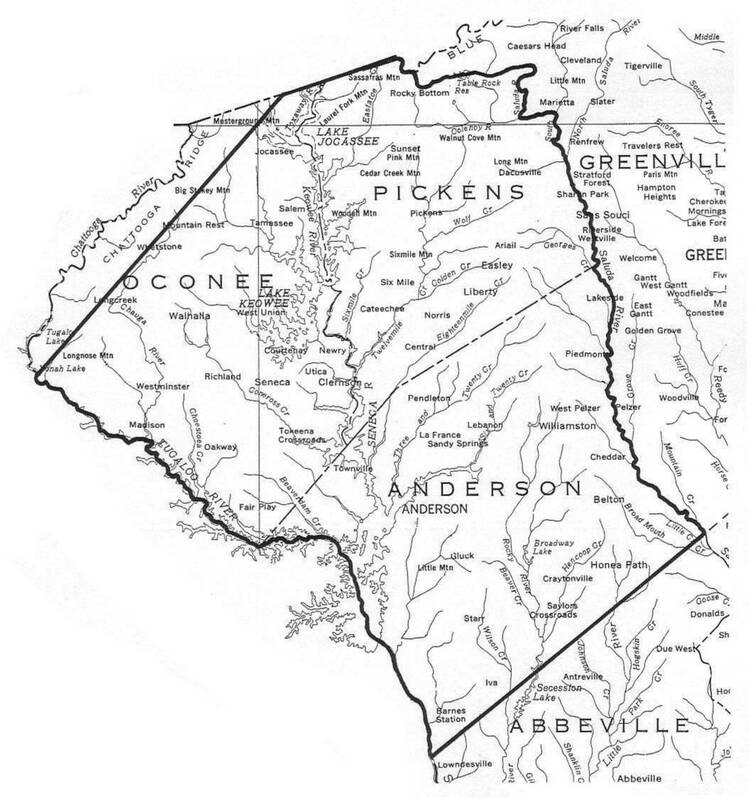 By the year 1790, the time of the first Federal Census, Pendleton was the principal frontier area of South Carolina (SC) and was the main SC gateway to what remained of Cherokee territory. 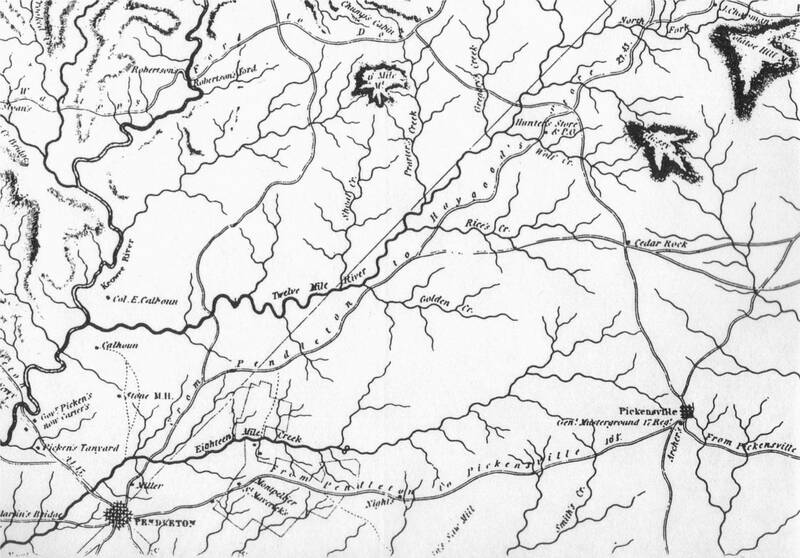 07 March 1789: Pendleton created from a previously unorganized area of South Carolina that had formerly belonged to the Cherokee Nation. My research, conducted at the South Carolina State Archives in April 1999, disclosed many early court and land records pertaining to Mayfields living in the Pendleton area, starting in 1785, four years before the county was created. The early Mayfield settlers in the Pendleton area all settled along tributaries of Twelve Mile River, viz., Goldens Creek, Rices Creek and Wolf Creek. The map shown below illustrates this area. 12 April 1799: Elijah and Elizabeth Mayfield convey a 270-acre tract on 12 Mile River to Bennet Combs. Witnesses to the transaction are Stephen Mayfield and Isham Mayfield. [See Deed Book E, pages 22-23] I could find no documentation in the county records as to how Elijah obtained title to this land. 10 January 1801: Elijah Mayfield and Elizabeth, his wife, convey a 260-acre tract on Rice's Creek of 12 Mile River to Edwin Bain. This was land that had been " ... granted to Stephen Mayfield the 19th day of February 1791 [sic] ... ." [This stated date of Stephen Mayfield's grant is wrong - it should be 02 December 1793!] The deed was recorded in Pendleton District on 11 March 1801. [See Deed Book F, pages 150-151] It should be noted that this deed is unreadable on the microfilm. I visited the SC State Archives at Columbia in July 2000 and reviewed the original Deed Book F. The ink is badly faded with respect to this indenture but is still readable. Six Mayfield households/families are identified in the 1790 Federal Census for Pendleton. In the 1790 Report the last names of all six are mispelled - "Mafield" instead of Mayfield. A comparison of the 1790 Census with the 1800 Census for Pendleton County indicates that two of the Mayfields listed in 1790 had moved out of the county by the time of the 1800 Census, i. e., Stephen and Isham Mayfield. Review of the land records cited in the above Chronology clearly show at least four of the six Mayfields included in the census lived on land that was either directly adjacent to or very near to each other. Based on the location descriptions contained in the land surveys, all of the Mayfields lived on tributaries of 12 Mile River; all except Stephen, lived on Goldens Creek. Both John and Ambrose Mayfield's land tracts were directly adjacent to that of a certain David Hamilton. Only Isham and one of the two John Mayfields listed in the 1790 Census do not seem to have had their own land. By 1791, another Mayfield not listed in the Census, Isaac, had moved into the area and settled on a tract of land adjacent to that of Elijah Mayfield; Isaac apparently did not stay long for he sold his 428-acre tract of land to a certain James Brown in 1794; Isaac does not appear in any of the Pendleton records thereafter. Elijah Mayfield 06 Apr 1785 Apparently the first Mayfield settler in area. He is almost certainly the Elijah Mayfield (1762-1843) who died in Maury County TN on 05 October 1843. Isaac Mayfield 15 Jul 1791 Isaac's land is directly adjacent to Elijah Mayfield's. Isaac may be the brother of Elijah Mayfield (1762-1843). If so, he was killed by Indians in Davidson County TN on 06 July 1794. David Hamilton 27 Jul 1791 David Hamilton's land is adjacent to John Mayfield's. John Mayfield 12 Oct 1791 This John Mayfield's land is directly adjacent to David Hamilton's. John removed to the town of Jefferson, in Rutherford County TN by 1810. Ambrose Mayfield 25 Oct 1791 Ambrose Mayfield's land is directly adjacent to David Hamilton's. Ambrose removed to the town of Jefferson, in Rutherford County TN by 1810. Stephen Mayfield 10 Mar 1792 Stephen's land is directly adjacent to Isaac's. He is almost certainly the same Stephen Mayfield who died in Overton County TN in 1834. Isham Mayfield No Land Survey Isham Mayfield is listed in 1790 Census, but no land records for him have been found. Isham is the brother of Stephen Mayfield (d. 1834). John Mayfield No Land Survey This younger John Mayfield is listed in 1790 Census, but no land records for him have been found. John removed to the town of Jefferson, in Rutherford County TN by 1810.